Tour to Char Dham,Char dham Tour,Chardham in India,Tour to Chardham in India,Travel to Char Dham,Char Dham Tour Packages. Board an early morning train to Haridwar from Delhi. On arrival, an India Profile representative will help you transfer to the hotel. Relax for the remaining part of the day. Stay overnight at the hotel. On day 2 of the Char Dham tour, travel from Haridwar to Badrinath in the morning. Upon arrival, check into a resort / hotel and rest awhile. Later, set out to visit the holy sites of Badrinath before returning for an overnight stay at the hotel / resort. Your tour itinerary for Char Dham will include an early Morning Prayer session. Thereafter, drive to Gaurikund or Sitapur. On arrival at Gaurikund / Sitapur, check into a hotel / lodge for an overnight stay. Your itinerary for Char Dham will include a trek to the Kedarnath Shrine. On arrival, check into the hotel and rest awhile. Later visit the shrine. Return for an overnight stay at the hotel / lodge. Attend the Morning Prayer before embarking on a 14 km trek to Gaurikund and later drive to Uttarkashi that lies 263 km away. On arrival in Uttarkashi, check into a hotel for an overnight stay. Drive to Gangotri early in the morning. Arrive at around 1000 hrs and proceed for a darshan of the shrine. Drive back to Uttarkashi at around 1600 hrs. Stay overnight at Uttarkashi. Drive to Janki Chatti at around 10 in the morning. Check in at a hotel / lodge for an overnight stay. As part of the Char Dham tour, embark on a trek to Yamunotri. Have a darshan of the shrine and later trek back to Janki Chatti. Stay overnight at Janki Chatti. Drive back to Haridwar in the morning. On arrival, transfer to the railway station to board a train to Delhi, taking back happy memories of your travel to Char Dham. 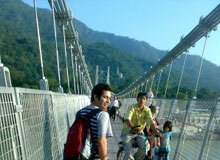 India Profile offers online bookings for its Tour Itinerary for Char Dham.